The British Parliament declared war on Germany on 3 September 1939, following a 24 hour ultimatum to Germany to remove all their forces from Poland or else. France declared war that same day, too. Hitler was hoping Britain wouldn't declare war, but always knew they might. This time it was up to Parliament and not Britain's Prime Minister Neville Chamberlain, who Hitler had previously gotten to back down on other key issues. But he felt confident that with his superior intellect and military genius the British could be defeated. What was he thinking? If Hitler had been half as smart as he thought he was, he would've known that the best he could have done against the British was to achieve a stalemate, like they did in World War One. Britain had far more experience in warfare and had literally ruled the seas for the past three and a half centuries. They also had the world's oldest and best intelligence (spy) network. Seeing how the sun never sets on the British Empire, encompassing one-fifth of the world's population, they had the resources, manpower and material to sustain themselves for as long as required, but yet not enough to defeat the Axis powers. To do that, Britain would need either the United States or the Soviet Union to join them. The Western Front did end up somewhat like in World War One, except that this time the trench was the English Channel itself. It remained that way until the United States got there to break the stalemate. Even by then, the Soviet Union had already broken Hitler's back and were advancing towards Germany. Britain's Prime Minister Chamberlain proved he wasn't the right man to lead a war. Rather than launching an immediate offensive, he tried winning the war with words and propaganda. He had leaflets dropped all over Germany to tell them just how wrong the Nazis were. The eight months of Chamberlain's inactivity were given a lot of names. Winston Churchill called this period the "Twilight War." The Germans called it "der Sitzkrieg" (the sitting war). Translated, the Poles referred to it as the "Strange War" while the French said "Funny War." Time magazine called it the "Lullablitz." Others joked with the "Bore War." But the name that really stuck was the "Phony War." In April of 1940, German troops invaded Denmark and Norway. The next month (10 May) they entered Belgium, the Netherlands and Luxembourg and three days later they marched into France. Now that the war had gotten serious, a serious Prime Minister was needed. 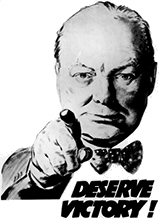 With that said, King George VI appointed Churchill to replace Chamberlain. France fell in June 1940, leaving Britain alone to fight against the Axis. But not only were they able to defend their island, they continued on with their offense, too. They bombed targets in Germany and other enemy positions in occupied Europe. They defeated the Italians in Libya. And they attacked the Axis powers throughout the Mediterranean Sea. Then in June of 1941, Hitler was dumb enough to invade Russia. This took some of the heat off and the British were able to step up their offensives even more. Towards the end of the year, the Japanese bombed Pearl Harbor and the very next day, Hitler declared war on the United States. Note: The United States was the only country that Hitler officially declared war upon. With the other nations, he just simply attacked without warning. For the British, this new war in the Pacific meant their war had turned global, stretching their men and resources even more. But on the positive side, this finally got the US into the war and in all theaters. The outcome was obvious to everyone except Hitler and Tojo. The story of Britain in WWII is absolutely one fantastic story, providing many lessons to be learned. This was definitely the toughest war they had ever fought. These people not only proved they can hold their own against any military, they showed how valuable their experience was. On the Home Front, they already knew what to do. For example, they immediately began rationing on a national level, they evacuated their children to safer places, and they put their women to work... in both private companies and in the military. Even the Royal Princess Elizabeth served as an ambulance driver.